"Metal Wall Sculpture in Rod Library by Ralph Haskell"
An image of the sculpture named Metal Wall Sculpture on the campus of the University of Northern Iowa in Cedar Falls, Iowa. 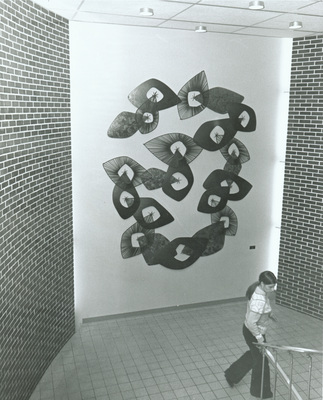 The sculpture by Ralph Haskell was installed in the east stairwell of Rod Library in 1964. "Metal Wall Sculpture in Rod Library by Ralph Haskell" (2019). Art on Campus Photographs. 36.